Son Heung-min hit a brace as Tottenham kept their Premier League title ambitions alive with a comprehensive win over a poor Watford side at White Hart Lane. With Mauricio Pochettino's men looking to reel in leaders Chelsea, top goalscorer Harry Kane was back on the bench less than a month after suffering an ankle injury. But once again Spurs proved they do not need to rely on Kane's goals as Son struck either side of half-time to wrap up a convincing 4-0 win after quality finishes from Dele Alli and Eric Dier had set them on their way. Tottenham, who also hit the crossbar three times, were never likely to suffer defeat against a Watford side plagued by injuries as Walter Mazzarri shuffled his pack with Troy Deeney only on the bench due to fatigue. Although all eyes were on Kane, his replacement in the side Vincent Janssen came close to opening the scoring but former Spurs goalkeeper Heurelho Gomes kept out his shot with his feet. Janssen, who is still yet to score from open play in the Premier League, then passed up the chance to net an open goal from all of three yards out. Kieran Trippier pulled a long ball back across goal but, with Gomes taken out of the game, the Holland international did not react in time and it hit his thigh before bouncing off the bar. Without Kane, Spurs have instead looked to his England team-mate Alli for inspiration and it was the 20-year-old who gave the hosts the lead shortly after the half-hour. Referee Anthony Taylor gave Spurs the advantage as Abdoulaye Doucoure hauled down Mousa Dembele and the ball eventually broke for Alli, who curled home a perfect 25-yard effort. The second followed soon after and it was Dier who was on hand to convert from the edge of the box for his second goal in three games, having previously gone all season without scoring. The competition for goal of the day continued as Son got himself on the scoresheet with another effort from outside of the penalty area. The South Korea international was gifted far too much space as he ran through on goal and steered a low strike past Gomes before the break. Son needed less than 10 second-half minutes to double his tally for the afternoon, sweeping home another Trippier cross at the back post. 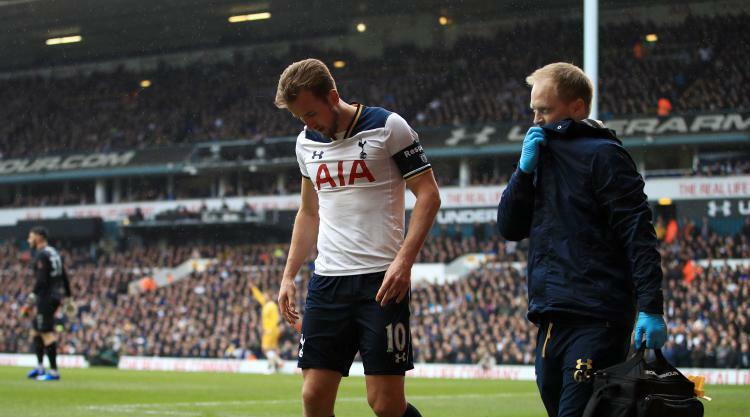 Kane was introduced with 30 minutes to go, replacing Janssen after another disappointing display from the summer arrival. The England hitman rounded Gomes but saw a tame shot cleared by Craig Cathcart and should have scored with 15 minutes remaining but could not make meaningful contact to a Trippier cross. Son had two great chances to complete his hat-trick late on, inexplicably shooting wide when unselfishly played in by Kane before hitting the crossbar after more good work from Trippier. Kane himself rattled the frame of the goal with a last-gasp free-kick but the three points had long-been secured as Spurs cruised to a sixth straight league win.